PSV youth academy product Roy Beerens moved abroad in summer 2014. The winger joined German outfit Hertha Berlin on a 3-year deal from AZ. Hertha is coached bu Dutchman Jos Luhukay. In July 2016 Beerens moved to England to play for Reading, also coached by a Dutchman: Jaap Stam. 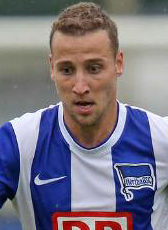 Beerens signed a 3-year contract at The Championship side. In the break of the 2017-18 season, he returned home. Beerens signed for Vitesse Arnhem until 2021.